24 hours of gaming all under one roof and iSandBOX will be there! In just over a week’s time, Aberdeen will play host to the North-east’s largest gaming convention, 4 The Gamers (4TG). 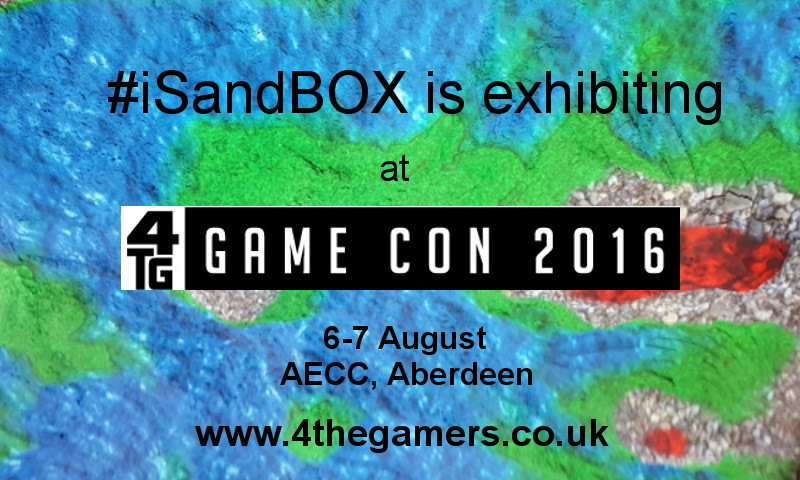 iSandBOX will be there and our wee interactive sandbox is really excited about being alongside like-minded friends. The exhibition, which will take place at the AECC on 6-7th August 2016, will showcase some of the latest technologies in the gaming world. There will be lots to see and there’ll be live staged console E-Sports Tournaments on Streetfighter V and Halo 5 Guardians. A panel of experts are lined up to speak at the event and offer advice, including Gaming Fuel, Entrepreneurial Spark, IGDA Scotland, LT Zonda and Jean Kelly. We hope that iSandBOX will get lots of attention too! iSandBOX is an interactive sandbox that brings sand to life, using augmented reality. Its games are fun and create a magical experience for children aged 3-7. Come along and say “Hi” and see our amazing iSandBOX!